On Feb. 18, Meredith “Merry” Edwards will be inducted into the Vintners Hall of Fame at the Culinary Institute of America in Napa Valley. She will be just the fourth female among the total 47 inductees -- Jamie Davies (Schramsberg), Zelma Long (Simi, Vilafonte) and Carol Meredith (UC Davis, Lagier Meredith) are the others -- and her inclusion is long overdue. Few have contributed as much to modern, high-end California winemaking as Edwards. And few have flown so low under the radar. Merry has been so far ahead of many curves -- the importance of matching grapevine clones to specific vineyard sites, and her Masters thesis on the health risk of lead capsules, to name just two -- that her discoveries were not fully accepted until others affirmed her research. Edwards has always been ahead of her time, yet her time for formal recognition is now. Edwards became a superstar in the ultra-premium winemaking universe in the late 1990s and through the 2000s with her Pinot Noir-focused Merry Edwards Wines brand (a.k.a. Meredith Vineyard Estate), based on grapes grown in the Russian River Valley and Sonoma Coast appellations. Yet she had been a pioneer since 1973, when she was one of the first women to graduate from UC Davis with a winemaking-based degree, a Masters in Food Science with an enology emphasis. She became one of California’s first contemporary female winemakers, at Mount Eden Vineyards in the Santa Cruz Mountains in 1974 -- shunning the Napa and Sonoma laboratory jobs that were typically offered to women at the time. Merry left Mount Eden in 1977 to become founding winemaker at Matanzas Creek Winery in Sonoma Valley, and to begin her own Merry Vintners business in the Russian River Valley. Edwards left Matanzas Creek in 1984 -- after putting Sandra and Bill McIvor’s winery on the map with her elegant barrel-fermented Chardonnays and Sauvignon Blancs, produced from clone-specific plantings -- and built the Merry Vintners Winery west of Santa Rosa (now DeLoach Vineyards). Clonal diversity has always been at the forefront of Edwards’ mind, and she received inspiration from Joseph Swan of Joseph Swan Vineyards, for whom the “Swan” Pinot Noir clone is named. It was a visit to the University of Beaune in Burgundy in 1977 that convinced Edwards of the importance of matching clones to sites -- a notion scoffed at by her peers at the time. They wanted big, reliable yields in every vintage; superior quality and nuance wasn’t in their mindset. In 1985, Edwards began making headway in convincing grapegrowers of the virtues of planting diverse clones in their vineyards, after she taught a clonal seminar at UC Davis, with Dr. Harold Olmo. Today, planting specific clones and rootstocks in vineyards is old-hat, a no-brainer. Heretic Merry was proved right. Her resume includes vice president/winemaker of Laurier Winery in the Russian River Valley (the company that hired Edwards went belly-up after two years, through no fault of her own; the estate is now Hartford Family Winery) and consultant to myriad wine companies, including Lambert Bridge, Liparita and Pellegrini Family Vineyards. Yet it is her own Meredith Vineyards Estate/Merry Edwards Wines that have brought her the success and satisfaction she has sought for so long. In 1996, Edwards acquired the property that is now Meredith Vineyard Estate, in the Russian River Valley. She and her husband, Ken Coopersmith, have since planted, purchased, and/or obtained long-term leases for the Coopersmith (where the winery is located), Georganne, Klopp, Sanchietti and Flax vineyards -- all in the Russian River Valley, and suppliers of Pinot Noir grapes. My favorite Merry Edwards wine is her Olivet Lane Russian River Valley Pinot Noir, made from grapes purchased from Bob Pellegrini’s vineyard. The wine typically has a refined, elegant texture and refreshing acidity, leaning toward bright cherry rather than blackberry aromas and flavors. It’s pretty more than powerful. Other Merry Edwards Pinot Noirs have firm tannic grip, to ensure longevity, with black cherry/berry, truffle and spice character, yet they remain crisp and succulent. If her mouth doesn’t water when tasting her wines, Edwards goes back to the drawing board. She has also earned acclaim for her barrel-fermented Russian River Valley Sauvignon Blanc -- layered and complex, with a Graves-like structure combined with a citrus-based California fruitiness. It’s a style I adore, and see so little of from California producers. Since 1973, Merry Edwards has done the hard yard, slowly gaining acceptance for her vision and her wines. 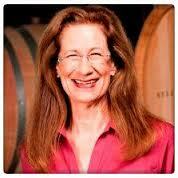 I’m thrilled that the Vintners Hall of Fame will recognize her for her accomplishments. Full disclosure: I worked the 1990 harvest with Merry, as a lowly vineyard Brix sampler and cellar rat with no prior knowledge of winemaking. I was a rube, not a worker she would remember, but I will always remember Merry and all that she taught me about clonal differences, Brix and acidity levels, and how to recognize site character. Her induction into the Vintners Hall of Fame is warranted from any objective view, and even more so my own view.